Secure Sockets Layer/Transport Layer Security (SSL/TLS) certificates are used to secure network communications and establish the identity of websites over the internet. Before issuing a certificate for your website, Amazon must validate that you control the domain name for your site. 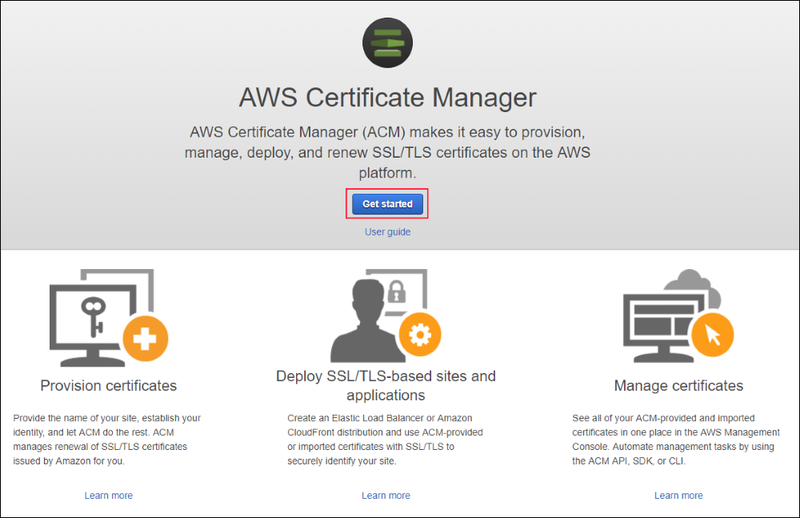 You can now use AWS Certificate Manager (ACM) Domain Name System (DNS) validation to establish that you control a domain name when requesting SSL/TLS certificates with ACM. Previously ACM supported only email validation, which required the domain owner to receive an email for each certificate request and validate the information in the request before approving it. With DNS validation, you write a CNAME record to your DNS configuration to establish control of your domain name. After you have configured the CNAME record, ACM can automatically renew DNS-validated certificates before they expire, as long as the DNS record has not changed. 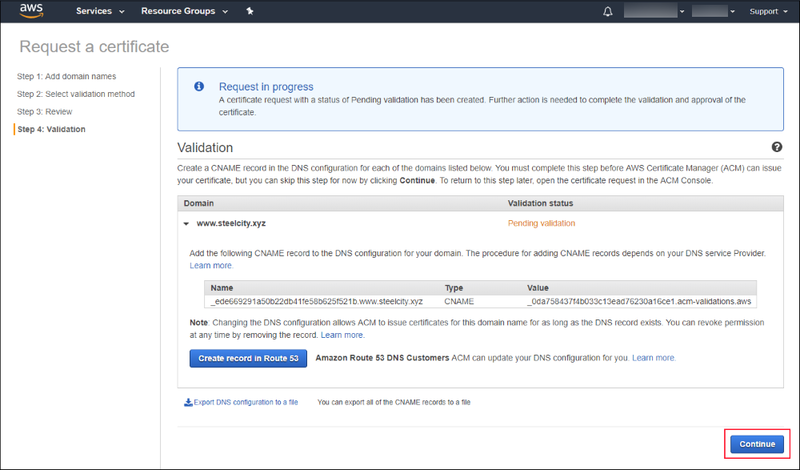 To make it even easier to validate your domain, ACM can update your DNS configuration for you if you manage your DNS records with Amazon Route 53. In this blog post, I demonstrate how to request a certificate for a website by using DNS validation. To perform the equivalent steps using the AWS CLI or AWS APIs and SDKs, see AWS Certificate Manager in the AWS CLI Reference and the ACM API Reference. In this section, I walk you through the four steps required to obtain an SSL/TLS certificate through ACM to identify your site over the internet. SSL/TLS provides encryption for sensitive data in transit and authentication by using certificates to establish the identity of your site and secure connections between browsers and applications and your site. DNS validation and SSL/TLS certificates provisioned through ACM are free. To get started, sign in to the AWS Management Console and navigate to the ACM console. Choose Get started to request a certificate. If you previously managed certificates in ACM, you will instead see a table with your certificates and a button to request a new certificate. Choose Request a certificate to request a new certificate. Type the name of your domain in the Domain name box and choose Next. In this example, I type www.example.com. You must use a domain name that you control. Requesting certificates for domains that you don’t control violates the AWS Service Terms. With DNS validation, you write a CNAME record to your DNS configuration to establish control of your domain name. Choose DNS validation, and then choose Review. Review your request and choose Confirm and request to request the certificate. After a brief delay while ACM populates your domain validation information, choose the down arrow (highlighted in the following screenshot) to display all the validation information for your domain. ACM displays the CNAME record you must add to your DNS configuration to validate that you control the domain name in your certificate request. If you use a DNS provider other than Route 53 or if you use a different AWS account to manage DNS records in Route 53, copy the DNS CNAME information from the validation information, or export it to a file (choose Export DNS configuration to a file) and write it to your DNS configuration. For information about how to add or modify DNS records, check with your DNS provider. For more information about using DNS with Route 53 DNS, see the Route 53 documentation. If you manage DNS records for your domain with Route 53 in the same AWS account, choose Create record in Route 53 to have ACM update your DNS configuration for you. After updating your DNS configuration, choose Continue to return to the ACM table view. ACM then displays a table that includes all your certificates. The certificate you requested is displayed so that you can see the status of your request. After you write the DNS record or have ACM write the record for you, it typically takes DNS 30 minutes to propagate the record, and it might take several hours for Amazon to validate it and issue the certificate. During this time, ACM shows the Validation status as Pending validation. After ACM validates the domain name, ACM updates the Validation status to Success. After the certificate is issued, the certificate status is updated to Issued. If ACM cannot validate your DNS record and issue the certificate after 72 hours, the request times out, and ACM displays a Timed out validation status. To recover, you must make a new request. Refer to the Troubleshooting Section of the ACM User Guide for instructions about troubleshooting validation or issuance failures. You now have an ACM certificate that you can use to secure your application or website. For information about how to deploy certificates with other AWS services, see the documentation for Amazon CloudFront, Amazon API Gateway, Application Load Balancers, and Classic Load Balancers. Note that your certificate must be in the US East (N. Virginia) Region to use the certificate with CloudFront. 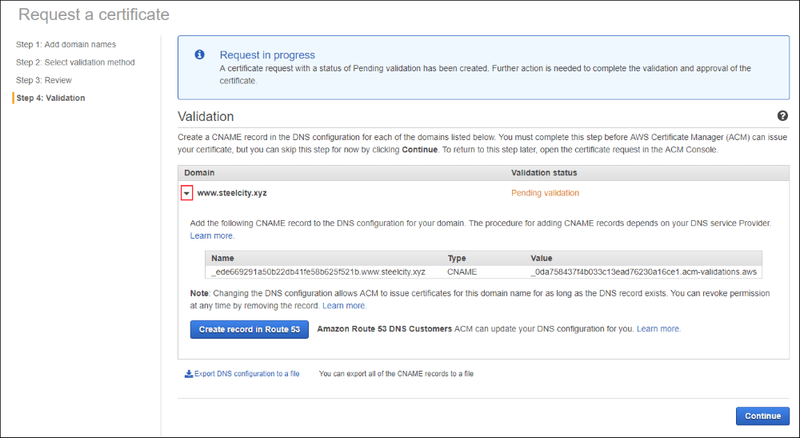 ACM automatically renews certificates that are deployed and in use with other AWS services as long as the CNAME record remains in your DNS configuration. To learn more about ACM DNS validation, see the ACM FAQs and the ACM documentation. If you have comments about this post, submit them in the “Comments” section below. If you have questions about this blog post, start a new thread on the ACM forum or contact AWS Support.